We need to check our Computer Hardware information's for varies reasons such as finding drivers, replacing hardware etc. There are many tools available for doing this purpose, HWiNFO is a nice application for getting hardware information from your Computer. HWiNFO has 32bit distribution as well as 64 bit distribution, also HWiNFO is a FREEWARE so you can use and distribute it for FREE. This is the best way to identify a Hardware component without opening the Computer's case. Also, that will help you identify features of a motherboard, video card, memory or processor. In oder to use this application, download it from the above link. Now, let us run this program, before you run the application, check your operating system for weather it is a 32 bit or a 64 bit. Then, run the suitable application, while running you can configure the setting using Configure button. Now, it will open the window with System summary. This System Summary contains information's about Processor, Graphic card, Memory, Hard disk and DVD or CD ROM drive. In the main application window, you can find hardware items on left hand side in a hierarchical manner. So, you can click on that hardware and get information from right side of the window. 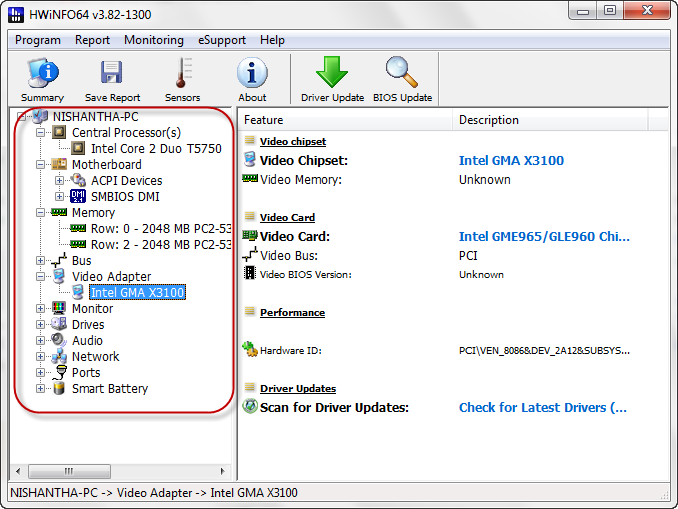 Click on the Summary to get summary of hardware information,see the following animation. It will illustrate you to this procedure. In oder to get a report about your hardware, click on the Save Report and select the report type as you require. Browse for a location to save and click Next. After that, select the hardware by adding ticks and finally press on Finish button. It will save a more information's about your computer's hardware's. Click on the Sensors to get an information's temperature's and Battery level. See the animation below.